Much like the rest of the positions, TE's have been greatly thinned out as we enter the WC weekend. And much like the quarterback position, I will not spend time breaking down five different TE's this week. There are really only two TE's that stand out to me. Jordan Reed will cost you $1300 more than Tyler Eifert ($5000). 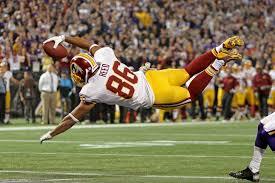 Reed is the best playmaker in the Redskins offense. Jordan Reed has been dominating the target share through Cousins hot streak. Reed has gone over 100 yards in two of the last four weeks and has added five touchdowns during that same span. Since Jordan Reed came into the NFL, the consensus thought was he had elite level talent but could not stay on the field due to health. While he was unable to play a full 16 games this season, Reed was still able to reach 952 yards and 11 touchdowns. Cousins is aware of his playmaking TE and the mismatches he creates. He will continue to use Reed in the middle of the field attempting to open up the long shot play to DeSean Jackson. Reed could easily be in line for a double-digit target/reception type game making him a viable candidate for all cash and GPP line ups in Wild Card weekend. Tyler Eifert played in 13 games, one less than Reed, and had 300 fewer yards but two more touchdowns. Eifert was consistently a trusted source inside the red zone. Eifert only played one game with A.J. McCarron, but that was all he needed to get back on track coming back from his concussion. Eifert caught all four targets McCarron threw his way in the regular season finale including a touchdown. 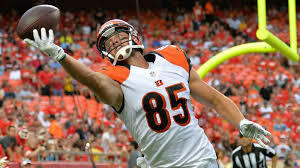 Whether Dalton or McCarron plays, Eifert will have his share of targets. His 70% catch rate helps both quarterbacks trust Eifert. He ranks 1st among TE's in three key areas according to FootballOutsiders.com which is why he quickly became one of the elite TE's in the NFL over the course of the 2015 regular season. While I do think Reed has a slightly better day, the price of $5000 makes Eifert a very appealing option this week. Heath Miller ($3300): Maybe Ben/Miller know something the rest of the world does not. In the 13 games where the Steelers were not playing the Bengals, Miller averaged 3.07 receptions per game. In the two games, the Steelers did play the Bengals, Miller caught 20 balls for 171 yards. Miller makes a decent sleeper pick this week for a mere $3300. Kyle Rudolph ($3500): I like Rudolph as a player and I also believe he has a bright future. With that said, the Vikings offense is extremely limited and will remain so throughout the playoffs. His upside is capped by his young play caller, Teddy Bridgewater. Rudolph may be in for a nice 2016, but I am laying off for DFS this week. Travis Kelce ($4500): Kelce is a natural playmaker at the TE position. He has an amazing size/speed combination, but even with the injuries the Chiefs suffered, he was still limited in this offense. I am not sure when we will see the full potential of Travis Kelce, but I will have to wait until 2016 before I invest in his services. 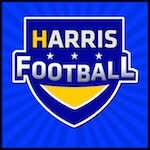 I will answer any and all DFS/fantasy football questions.